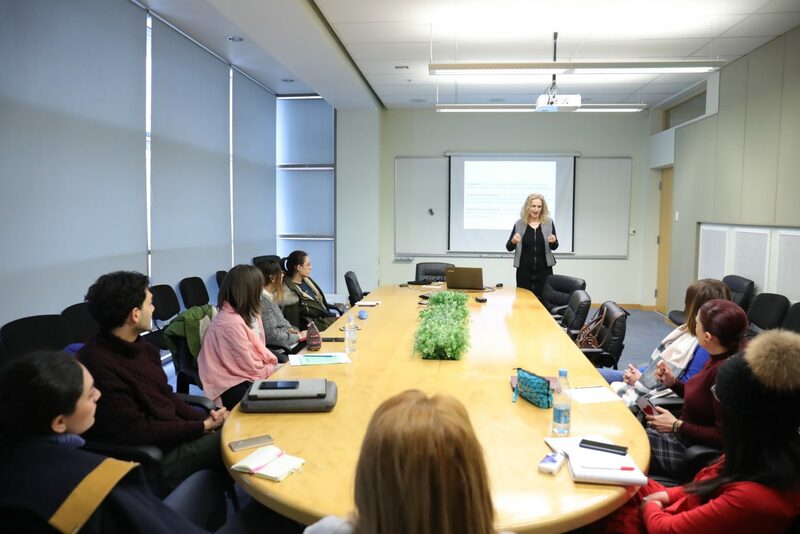 YEREVAN, Armenia – On February 27-28, 2019, Teaching English as a Foreign Language (TEFL) program and Center for Research in Applied Linguistics (CRAL) of the American University of Armenia (AUA) hosted several meetings with Dr. Melita Kovačević. Dr. Kovačević is a Full Professor in the Department of Speech and Language Pathology, former Vice-Rector for Research and Technology, and now Director of Doctoral Studies in Language and Cognition at the University of Zagreb, Croatia. She is an international expert in language acquisition, language therapy, psycholinguistics, bilingualism, multilingualism, and corpus linguistics. 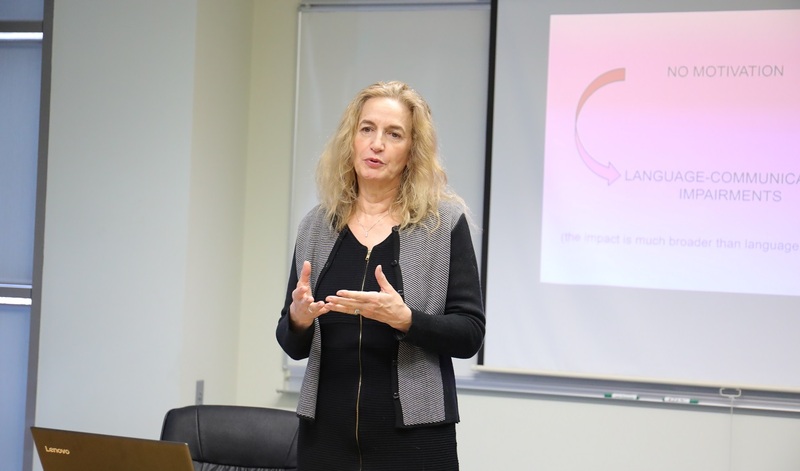 During her lectures with TEFL students and alumni, Dr. Kovačević talked about cognitive and social aspects of developmental psychology, specific language impairments, language acquisition and developmental stages of monolingual and bilingual children. Many families in Armenia grow their children bi- or multi-lingual. An important topic of discussions with Dr. Kovačević was the cognitive and linguistic implications of bilingualism and multilingualism including cases of children with language impairments. According to current research, children with language impairments indeed can be bilingual: “Should children with language impairments be exposed to a second language? Absolutely, yes,” remarked Dr. Kovačević. She added that acquiring two languages from childhood does not add problems; the impairment may not change, but two languages are likely to have a positive cognitive and social effect. “Bilingualism is not our choice, it’s the reality today,” stressed Dr. Kovačević. Another topic of discussion included psychological differences among learners and implications for teachers. Dr. Kovačević talked about introverted and extroverted students, low achievers and the possible issues they may face. She gave several recommendations and clarified the teacher’s role in such situations. She stressed the importance of motivation in communication and language development, talking about basic needs, wishes, communication with the primary and extended environment, self-realization and cognitive challenges that the learners may face. During her visit, Dr. Kovačević also met with CRAL researchers and provided her expert opinion on the on-going corpus-based project on vocabulary in Eastern Armenian. This project is part of the CRAL research agenda, which aims to contribute to evidence-based understanding of learning and teaching of Eastern Armenian as a second language among children in local schools.